I was over at Tommaso Dorigo's Blog, Quantum Diaries Survivor" reading his take on Extraterrestrials: A Dime A Dozen and the opening with Stephen Hawkings Lecture. I cut out the section of my interest as well to see what Dr. Hawking was talking about, besides reading Tommaso's take. Qualitatively, I have come to realize, given the framework for consideration of such possibilities, these equations mean an inductive/deductive self evident constraint how are we ever to consider the possibility( You have to give yourself permission to entertain). I mean can we ever know the framework of that Extraterrestrial Intelligence given the parameters for our own belief structures? We do not even know what is possible "not having the framework" to properly question how this can be so? So what I found in Dr.Hawkings lecture was the generalities of consensus across the industry of science and no new ways in which to possibly perceive the" right questions concerning the framework for possible new intelligences" that we would perceive as Extraterrestrials. ...........DR. HAWKING: What will we find when we go into space? Is there alien life out there, or are we alone in the universe? We believe that life arose spontaneously on the Earth. So it must be possible for life to appear on othersuitable planets, of which there seem to be a large number in the galaxy. But we don't know how life first appeared. The probability of something as complicated as a DNA molecule being formed by random collisions of atoms in ocean is incredibly small. However, there might have been some simpler macro molecule which can build up the DNA or some other macro molecule capable of reproducing itself. Still, even if the probability of life appearing on a suitable planet is very small, since the universe is infinite, life would have appeared somewhere. If the probability is very low, the distance between two independent occurrences of life would be very large. However, there is a possibility known as panspermia that life could spread from planet to planet or from stellar system to stellar system carried on meteors. We know that Earth has been hit by meteors that came from Mars, and others may have come from further afield. We have no evidence that any meteors carried life, but it remains a possibility. An important feature of life spread by panspermia is that it would have the same basis which would be DNA for life in the neighborhood of the Earth. On the other hand, an independent occurrence of life would be extremely unlikely to be DNA based. So watch out if you meet an alien. You could be infected with a disease against which you have no resistance. One piece of observational evidence on the probability of life appearing is that we have fossils from 3.5 billion years ago. The Earth was formed 4.6 billion years ago and was probably too hot for about the first half billion years. So life appeared on Earth within half-a-billion years of it being possible, which is short compared to the 10-billion-year lifetime of an Earth-like planet. This would suggest either panspermia or that the probability of life appearing independently is reasonably high. If it was very low, one would have expected it to take most of the 10 billion years available. If it is panspermia, any life in the solar system or in nearby stellar systems will also be DNA based. While there may be primitive life in another region of the galaxy, there don't seem to be any advanced intelligent beings. We don't appear to have been visited by aliens. I am discounting reports of UFOs. Why would they appear only to cranks and weirdos? DR. HAWKING: If there is a government conspiracy to suppress the reports and keep for itself the scientific knowledge the aliens bring, it seems to have been a singularly ineffective policy so far. Furthermore, despite an extensive search by the SETI project, we haven't heard any alien television quiz shows. This probably indicates that there are no alien civilizations at our stage of development within the radius of a few hundred lightyears. Issuing an insurance policy against abduction by aliens seems a pretty safe bet. Why haven't we heard from anyone out there? One view is expressed in this Calvin cartoon. The caption reads: "Sometimes I think that the surest sign that intelligent life exists elsewhere in the universe is that none of it has tried to contact us." More seriously, there could be three possible explanations of why we haven't heard from aliens. First, it may be that the probability of primitive life appearing on a suitable planet is very low. Second, the probability of primitive life appearing may be reasonably high, but the probability of that life developing intelligence like ours may be very low. Just because evolution led to intelligence in our case, we shouldn't assume that intelligence is an inevitable consequence of Darwinian natural selection. It is not clear that intelligence confers a long-term survival advantage. Bacteria and insects will survive quite happily even if our so-called intelligence leads us to destroy ourselves. This is the third possibility. Life appears and in some cases develops into intelligent beings, but when it reaches a stage of sending radio signals, it will also have the technology to make nuclear bombs and other weapons of mass destruction. It will, therefore, be in danger of destroying itself before long. Let's hope this is not the reason we have not heard from anyone. Personally, I favor the second possibility that primitive life is relatively common, but that intelligent life is very rare. Some would say it has yet to occur on Earth. DR. HAWKING: Can we exist for a long time away from the Earth? Our experience with the ISS, the International Space Station, shows that it is possible for human beings to survive for many months away from Planet Earth. However, the zero gravity aboard it causes a number of undesirable physiological changes and weakening of the bones, as well as creating practical problems with liquids, et cetera. One would, therefore, want any long-term base for human beings to be on a planet or moon. By digging into the surface, one would get thermal insulation and protection from meteors and cosmic rays. The planet or moon could also serve as a source of the raw materials that would be needed if the extraterrestrial community was to be self-sustaining independently of Earth. What are the possible sites of a human colony in the solar system? The most obvious is the Moon. It is close by and relatively easy to reach. We have already landed on it and driven across it in a buggy. On the other hand, the Moon is small and without atmosphere or a magnetic field to deflect the solar radiation particles, like on Earth. There is no liquid water, but there may be ice in the craters at the north and south poles. A colony on the Moon could use this as a source of oxygen with power provided by nuclear energy or solar panels. The Moon could be a base for travel to the rest of the solar system. Mars is the obvious next target. It is half as far, again, as the Earth from the Sun and so receives half the warmth. It once had a magnetic field, but it decayed 4 billion years ago, leaving Mars without protection from solar radiation. It stripped Mars of most of its atmosphere, leaving it with only 1 percent of the pressure of the Earth's atmosphere. However, the pressure must have been higher in the past because we see what appear to be runoff channels and dried-up lakes. Liquid water cannot exist on Mars now. It would vaporize in the near-vacuum. This suggests that Mars had a warm wet period during which life might have appeared either spontaneously or through panspermia. There is no sign of life on Mars now, but if we found evidence that life had once existed, it would indicate that the probability of life developing on a suitable planet was fairly high. NASA has sent a large number of spacecraft to Mars, starting with Mariner 4 in 1964. It has surveyed the planet with a number of orbiters, the latest being the Mars Reconnaissance Orbiter. These orbiters have revealed deep gullies and the highest mountains in the solar system. 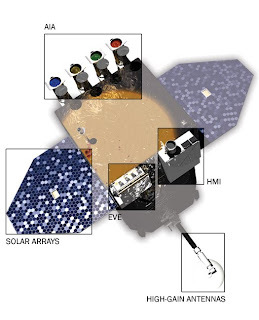 NASA has also landed a number of probes on the surface of Mars, most recently the two Mars Rovers. These have sent back pictures of a dry desert landscape. However, there is a large quantity of water in the form of ice in the polar regions. A colony on Mars could use this as a source of oxygen. There has been volcanic activity on Mars. This would have brought minerals and metals to the surface which a colony could use. The Moon and Mars are the most suitable sites for space colonies in the solar system. Mercury and Venus are too hot, while Jupiter and Saturn are gas giants with no solid surface. The moons of Mars are very small and have no advantages over Mars itself. Some of the moons of Jupiter and Saturn might be possible. In particular, Titan, a moon of Saturn, is larger and more massive than other moons and has a dense atmosphere. The Cassini-Huygens Mission of NASA and ESA has landed a probe on Titan which has sent back pictures of the surface. However, it is very cold, being so far from the sun, and I wouldn't fancy living next to a lake of liquid methane. What about beyond the solar system? Our observations indicate that a significant fraction of stars have planets around them. So far, we can detect only giant planets like Jupiter and Saturn, but it is reasonable to assume that they will be accompanied by smaller Earth-like planets. Some of these will lay in the [inaudible] zone where the distance from the stars is the right range for liquid water to exist on their surface. There are around a thousand stars within 30 lightyears of Earth. If 1 percent of each had Earth-size planets in the [inaudible] zone, we would have 10 candidate new worlds. We can revisit it with current technology, but we should make interstellar a long-term aim. By long term, I mean over the next 200 to 500 years. The human race has existed as a separate species for about 2 million years. Civilization began about 10,000 years ago, and the rate of development has been steadily increasing. If the human race is to continue for another million years, we will have to boldly go where no one has gone before. Thoughts have this forming effect too, and in the world of Physical constants, how are such thoughts to be measured? "Particulate expressions" in such reductionist modes which lead to a inductive/deductive self evidential state of a ever forming Higg's field?? What thought has traversed the room, to arrive on the other side of the room with consensus? Not as if, we can defy it's hold on us, while taking plane flights to experience this sensation of dropping fast to earth and leaving ourselves suspended for a time. That it is a consensus borne in mind that such an idea is limited to the framework for which all ideas about it are limited too. The net result is that the meager N=2.1 becomes over 20 trillions! This means that there are presently 20 trillion civilizations around. 20 trillions. Okay, we might have dropped or added one factor of a hundred too many here or there, but the number is still enormous, no escape! So as with the idea of Intelligences in the universe, I place gravity along side of it, as in the context of formulating the right questions. In Tommaso's blog the entry is the deciphering in context of the Drake Equation yet not bound by it in belief. This does not make Tommaso irresponsible to me in shirking the basis of that determination by using the equation. So of course along the way in my endeavors with those who I have conversed, or left trail bytes for consideration, is the idea that the world as we see it is not always as it seems and that by consensus, the framework is establish is one which limits our views according too. A "synopsis of the events" can lead us too, and as has been extrapolated according to the world of science. The thoughts that are left to me have been the idea of how scientists can ever introduce new formulations outside of that structure consensus without first taking a new baby step(how so?). They have had to all come to agreement on the latest version of that consensus. Then there are, the Physical Constants. It is as if in relation to the formulation to a mathematical consistency as a correlative function of the Drake equation in the process of. This does not mean we sanction irresponsibility to the quest of discovering new worlds of thought, be it in context of Extraterrestrial Intelligences, or even about gravity and the quantum world in which it shall work. I still visit those scientists who have placed "Outreach" even amidst the data and scientific endeavors they are pursuing. I look for the glimmer of hope that such baby steps are borne out of such minds. Having defined all the parameters of your science what would be the next question that would lead you to new insights? What new science beyond the experiments that you are working on? oscopelabs — July 29, 2008 — Irena Salina's award-winning documentary investigation into what experts label the most important political and environmental issue of the 21st Century - The World Water Crisis. Salina builds a case against the growing privatization of the world's dwindling fresh water supply with an unflinching focus on politics, pollution, human rights, and the emergence of a domineering world water cartel. Beyond identifying the problem, FLOW also gives viewers a look at the people and institutions providing practical solutions to the water crisis and those developing new technologies, which are fast becoming blueprints for a successful global and economic turnaround. The total mass of SDO at launch was 3000 kg (6620 lb); instruments 300 kg (660 lb), spacecraft 1300 kg (2870 lb), and fuel 1400 kg (3090 lb). Its overall length along the sun-pointing axis is 4.5 m, and each side is 2.22 m.
The span of the extended solar panels is 6.25 m.
The high-gain antennas rotate once each orbit to follow the Earth. April 21, 2010: Warning, the images you are about to see could take your breath away. At a press conference today in Washington DC, researchers unveiled "First Light" images from NASA's Solar Dynamics Observatory, a space telescope designed to study the sun. "SDO is working beautifully," reports project scientist Dean Pesnell of the Goddard Space Flight Center. "This is even better than we could have dreamed." Launched on February 11th from Cape Canaveral, the observatory has spent the past two months moving into a geosynchronous orbit and activating its instruments. As soon as SDO's telescope doors opened, the spacecraft began beaming back scenes so beautiful and puzzlingly complex that even seasoned observers were stunned. View related briefing materials here. NASA's recently launched Solar Dynamics Observatory, or SDO, is returning early images that confirm an unprecedented new capability for scientists to better understand our sun’s dynamic processes. These solar activities affect everything on Earth. Some of the images from the spacecraft show never-before-seen detail of material streaming outward and away from sunspots. 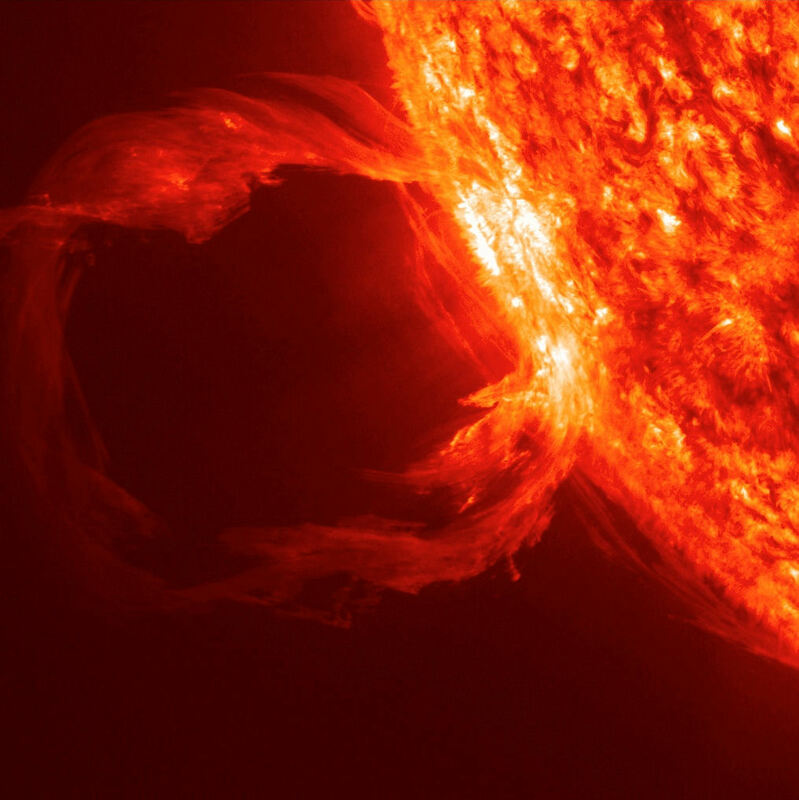 Others show extreme close-ups of activity on the sun’s surface. The spacecraft also has made the first high-resolution measurements of solar flares in a broad range of extreme ultraviolet wavelengths.